Suppose you have data that is stored in wide format in excel. You want to reshape it to long format. Insert a helper column right to column named "Project"
Select "I will create the page fields"
Use Convert Text to Column wizard by pressing ALT + D + E to separate "Name", "Dept","Project" values. 13 Responses to "Excel Formula : Convert data from wide to long format"
This is a simple and working formula. Big thanks for sharing it! 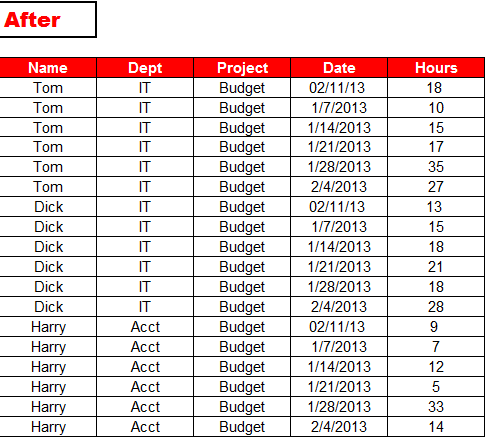 I wonder if Excel can match two data sets too by a common column? e.g. : data on species abundances with data on species traits. Keep on good work Deepanshu Bhalla! Yes it does; just apply vlookup command. Really really helpful!!!! Nice jobs! Very nice work, needs some explanation to get to know the real engineering behind these commands. For example what it actually does for "Multiple consolidation ranges" etc. Still its great as it works. This worked perfectly and saved me a lot of time. Thank you! I have followed all the steps for reshaping data from wide to long format in excel but still wont get my data in long format!! Whats the problem? It's hard to anticipate what went wrong for you. Please save your file on cloud drive and post file location here. This saved me hours and hours of work! Thank you so much! Hey How does this work if we have 6 more dates say end date consider the date column in your example as start date. so basically we have 2 sets ( 6 each) of columns. Alt+D+P is not working in Excel 2016. Please guide in this issue.